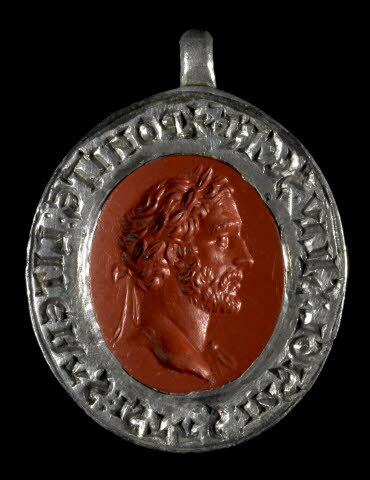 Silver seal matrix set with a red jasper Roman intaglio showing the emperor Antoninus Pius. Acquired with the assistance of Dr. John H. Rassweiler. He answered that he had a seal. The great man smiled. ‘It was not the custom in the past’, he said, ‘for every petty knight to have a seal. They are appropriate for kings and great men only’. The famous exchange quoted on the left captures in a few biting words the close and significant connections between seals and status. It evokes the perception that sealing related to social status, that this relationship changed over time, and that such historical developments were both recognized and highly charged. Finally—and perhaps one reason why the Battle anecdote has been so often quoted—these words suggest an important status for seals themselves within the medieval world of objects. If anything, this importance increased with their proliferation: seals eventually belonged to all kinds of people and institutions, and many individuals, corporations, and chanceries had several. Ultimately, seals’ forms and functions came both to articulate and to construct social as well as institutional and administrative hierarchies. Possible topics for papers include: Seals and heraldry; seals and inequality; seals and villeinage; seals of institutional office; seals and gender; non-heraldic personal seals; seals and status as represented in medieval and early modern texts; corporate seals and the status of institutions; the historiography of seals; the organization of chanceries; the development of sealing practices within and across social groups; relationships of seals to other works of art. Proposals are welcomed from a wide range of perspectives, such as: archaeology, history, art history, archival studies, literature. Submissions will be accepted in English, French, and German and should be no more than 300 words in length. Send to Lloyd de Beer (ldebeer@thebritishmuseum.ac.uk) by 30th January 2015. The conference will be held at the British Museum from the 4th – 6th December 2015. This conference is co-organised with John Cherry and Jessica Berenbeim in collaboration with Sigillvm, a network for the study of medieval European seals and sealing practices. This entry was posted in Call for Papers, Upcoming Events and tagged Agency, British Museum, Documents, objects, seals on January 5, 2015 by James Alexander Cameron.